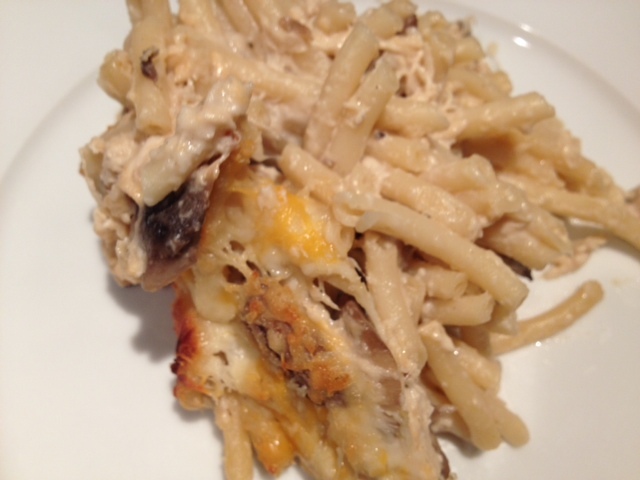 Tetrazzini is a traditional baked pasta dish made with cream sauce and mushrooms. 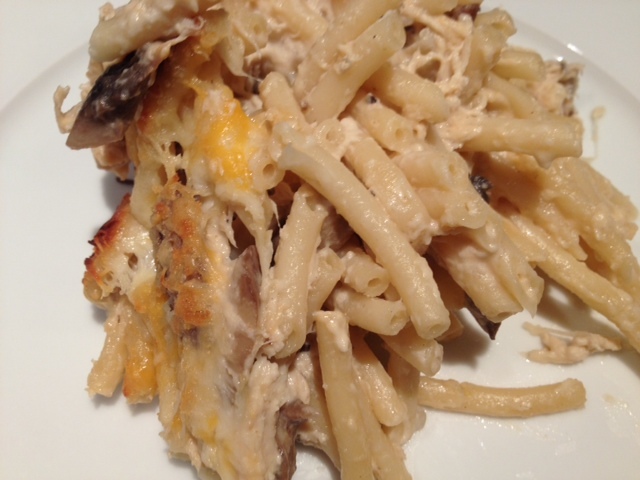 Turkey Tetrazzini is the most well-known dish, but I decided to make a lower-fat (no cream/no butter) version using chicken. 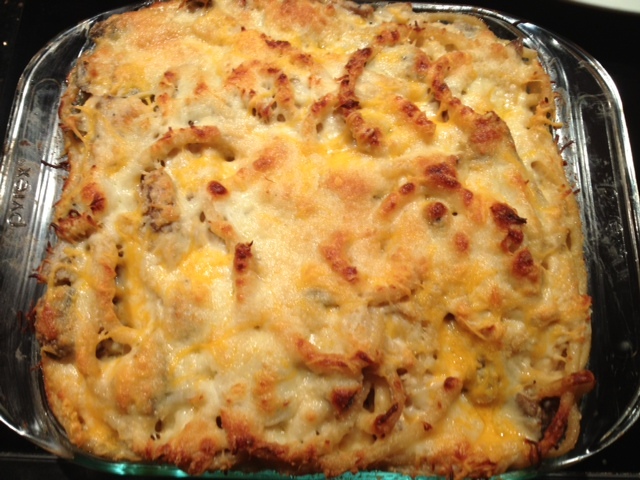 This warm, creamy, cheesy baked pasta is a great winter meal! Begin my heating 2 tbsp of olive oil in a large pant on medium heat. Add the shallots and crushed garlic and sautee for about 5 minutes. 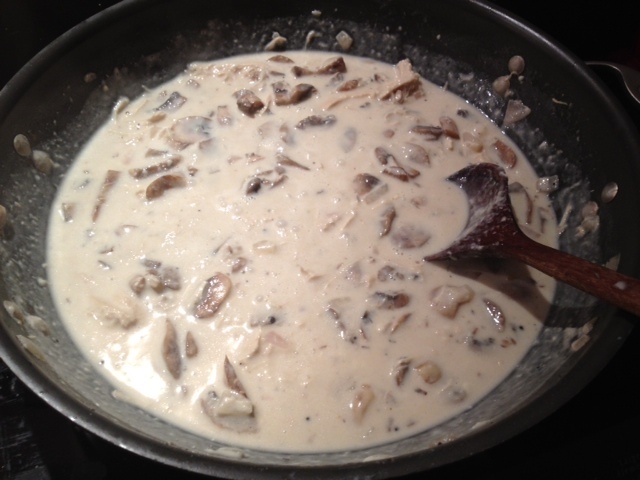 Then add the mushrooms and continue to sautee for about 10 more minutes. Next, add the chicken broth and stir in the sour cream, cream cheese and 1/4 cup grated parmesan. Reduce the heat so the sauce simmers but does not boil. Feel free to add a bit more broth if you feel the sauce is too thick. Add the chicken into the sauce and continue to simmer. Sprinkle a dash of salt and black pepper to season. While the sauce is simmering, cook your pasta as directed on the package to al dente. After you’ve drained all excess water, add the pasta directly into the sauce and combine. 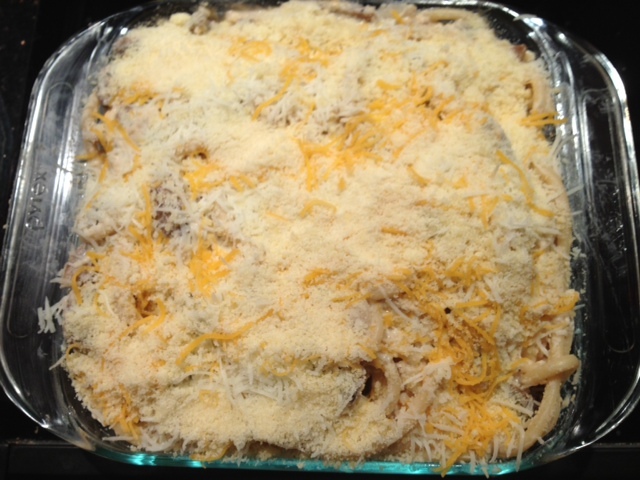 Toss the pasta with 1/2 cup of shredded mozzarella and then pour the pasta mixture into a greased baking dish. Top the pasta with the shredded cheddar, 1/4 cup shredded mozzarella and 1/4 cup grated parmesan. Bake in a 400 degree oven for about 20 minutes or until browned and bubbly.